If you’re considering same day crowns, that’s great. They’re useful and convenient. Here are three things your dentist may not have told you yet. When dentists bill your insurance, they use codes. The codes for crowns, whether you are using traditional crowns or same-day crowns, they’re billed by the material used, not the brand. While your dentist spent a small fortune on the machine, he is making up on lab fees by having it milled right in the office. This means you shouldn’t have to pay more for a CEREC crown than a traditional crown. Because they’re milled from a single block of porcelain, they don’t have all the subtleties your natural teeth have. A dentist has to be very versed in color theory and have exceptional skills. If your dentist is recommending a CEREC crown on an anterior (front) tooth, you need to check their qualifications. Ask to see samples of CEREC work they’ve done on front teeth. If it’s important to you to have the crown done on the same day, you’ll want to take the precaution of going to a dentist who has achieved accreditation with the American Academy of Cosmetic Dentistry. AACD accredited dentists are the top of their field. Often patients decide they want their teeth whiter at a certain point. However, the color made on your dental crowns (CEREC or traditional) is meant to be permanent. The whitening gel used even in professional teeth whitening only works on natural tooth structure. It saves you money in the long run to whiten your teeth before having your dental crown made. This way when the dentist does do it, you’ll have it match the color you’ll be proud of. It’s not required, of course. You can whiten later. It just means you’ll have to have your crown re-made to match. I had three crowns put on back teeth. I’ve had one other crown in the past without issue. This is the first time I’ve gotten CEREC crowns. Every time I bite down it’s a nightmare. I feel as if a knife is going through my jaw. Is it because it’s CEREC crowns or something else? I don’t think it’s the fact you received CEREC crowns this time which is causing the problem. When there is a pain on biting with dental crowns, whether traditional or CEREC, there is usually one of two causes. Do You Have a Lingering Infection? People often get dental crowns because of a tooth infection and root canal treatment. There are many canals in our teeth and some of them do a pretty good job of hiding from the dentist, even when they do everything right in the procedure. If he or she missed a canal it would explain the pain. You can have an x-ray done to see if there is still some ick left. Because the pain is when you’re biting down, it leads me to believe the crown may be seated too high. Generally, when we bite down the force is absorbed by all of our teeth. But, if your crown is seated higher than your other teeth, it’s taking on the full force of your bite, which would cause quite a “zing” of pain. If that’s the case, a simple adjustment by your dentist should do the trick. CEREC crowns are wonderful. They generally have a better chance of fitting perfectly because they’re milled by computer. They’re also incredibly convenient because you get it the same day and don’t need to bother with a temporary crown and second appointment. All that being said, there is one time I do not recommend a CEREC crown. Instead, you’d need the traditional all-porcelain crowns. 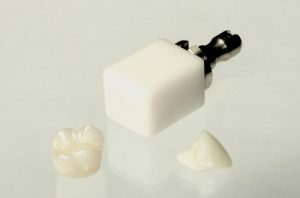 CEREC crowns are milled out of a single block of porcelain. That limits the variation and subtle color changes you’d normally be able to achieve when getting a traditional all-porcelain crown. On back teeth, that’s no big deal, but when you’re talking about your front teeth that’s a totally different story. Your front teeth are exposed when you smile and the light hits them which reveals their secrets even more. You’ll want a skilled cosmetic dentist to make sure you get a crown crafted with all the color and translucency changes you’d get with your natural teeth so they blend in beautifully. Do CEREC Crowns Break Easily? I’ve had crowns before and have never had any problems. My previous crowns were with a different dentist and were always the result of an infection gone mad which required a root canal treatment. This time, I decided to try to get treatment before an infection developed. Unfortunately, the new dentist said the cavity is too large for a traditional filling and will still need a crown (well, at least I don’t also need a root canal). It’s a step up. He told me he could give me a CEREC crown in just one day. I liked the idea of not missing more work and agreed, but after just two weeks it broke. I called the office and he offered to replace it for free. I’m hesitant to do so if it will just break again. Are CERECs weaker than other crowns? CEREC crowns are just as strong as traditional crowns. What happened in your situation is incredibly unusual. As you’ve had several crowns before, did you notice anything which felt unusual about this one? Maybe your crown hit your teeth before the rest of your teeth or possibly tooth pain when you bit down? I could see a crown breaking if it sat way too high, but even then it would take some flaws in the materials for it to break that soon after it was placed. In general CEREC crowns have less of a chance of having a problem because they’re designed by a sophisticated software program and milled by machine. They should fit perfectly. You didn’t mention pain, which again makes me wonder about something being off with the materials. Going forward, I’d give your dentist an opportunity to fix this. It’s so unusual for this to happen so I doubt it would again. If it does, the dentist would be the problem. If you happen to look up your dentist’s reviews and see this is a regular thing, then my suggestion would be to find another dentist. It probably wouldn’t matter what type of crown he gave you. In that case, you may want to see an emergency dentist in your area. They can help you get a crown and get you back on your way. You won’t want to wait too long because your teeth will shift into the open space left by the broken crown. I’m NOT saying this is what happened, but be careful about dentists whose prices are significantly lower than other dentists in the area. There is a huge difference between an affordable dentist and a cheap dentist. Our area was hit hard economically, so it’s tempting for patients to go for the cheapest. It’s also tempting for some (less ethical) dentists to draw in patients by lowering their prices, then buying subpar materials which helps them make up their profits. I’m considering getting a CEREC crown. Are they as good as their traditional counterparts? Which is better a CEREC or Traditional Crown? In one corner we have traditional porcelain crowns. Tried. True. Proven. Strong. Beautiful (with the right dentist). Though, they do take a couple of appointments. They’re milled from more than one block of porcelain. In the other corner are the CEREC crowns. Tried. True. Proven. Strong. Beautiful (with the right dentist). Made in one appointment. Though, they’re milled from one solid block of porcelain. Each time I type “Though”, I’m showing the downside of that particular type of crown. While two appointments aren’t horrible, it is definitely more convenient to have it done in one. You miss less work. You use less time. You have your permanent crown from the beginning. 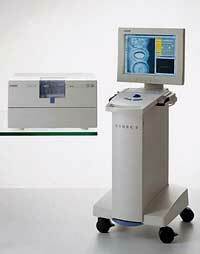 So, it would seem that the CEREC crown would be the better bargain. After all, the other features seem to be the same. So, what’s the big deal about the “Though” for CEREC crowns? Why does it matter if you mill a crown from one block of porcelain or more than one block? The difference comes from a cosmetic standpoint. Your teeth aren’t of identical translucency from top to bottom. The edges, especially at the bottom, are less opaque than the rest of the tooth. It seems to “thin out” a bit as you move down. There’s also a whiter color in the center than you’d find as you move down. When you mill from a single block of porcelain, the crown will seem the same from top to bottom. They can look a little flatter because there aren’t those subtle varieties. When a dentist can draw from more than one block and craft them together, you get the subtleties that reflect light a smidge better in natural teeth. In most cases, CEREC crowns are fantastic. They’ll still look beautiful. They’ll still match your teeth. They’ll still hold up to the stresses of daily use. The one exception is on a very front tooth. If you’re getting a crown on one of your very visible front teeth, that’s when I would opt for a traditional crown. This will allow the dentist to use his artistry and make sure every subtle variety of light and color comes through. Other than in that case, you will get a gorgeous crown with CEREC AND save yourself an additional appointment. One word of caution. No matter which you decide on, once the crown is completed and bonded on, the color cannot be changed. If you’re going to get your teeth whitened, do it before getting your crown designed. I’m so sick of temporary crowns that fall off all the time. Every time I’ve gotten a crown it’s been a disaster from the get-go. I get a temporary and it falls off at every meal. It’s impossible to deal with. Now I find out I need another crown. I told my dentist I want a CEREC crown so I don’t have to deal with a temporary. He insists they’re not as good. I’m seriously considering switching dentists over this. What do you think? I can understand your frustration. While temporary crowns do occasionally fall out (after all, they’re meant to be temporary) what you’ve experienced is way beyond normal. It says a bit about the skill of your dentist. I wouldn’t normally suggest switching dentists simply because you want a one-day crown, but it seems like your dentist lacks skill. I’m not sure why he means they’re not as good. They’re just as strong as their traditional counterparts. 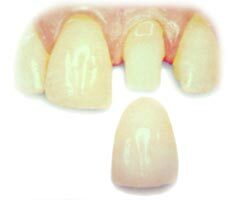 The biggest difference and the only weakness I can see in comparison is CEREC crowns are milled out of a single block of porcelain. Some dentists feel that for your very front teeth it would look better for you to have a traditionally made crown so the dentist can craft it from several blocks of porcelain giving it more natural variety. One other thing to consider. Hopefully, your dentist told you that once crowns are milled, their color is permanent. If you want your teeth whitened, you should do it before getting this latest crown if it is in a visible part of your smile. That way your dentist will match your crown to the new color. Of course, if any of your old crowns are visible, those will need to be re-done to match. If they’re on back teeth which don’t show while you smile, I wouldn’t bother changing them though. If you do decide to switch dentists over this issue. May I suggest you consider every type of procedure you may want, even future. If it’s just a good general dentist you want, who keeps up with the latest technology, that won’t be too hard to find. If, however, you have more cosmetic interests in your future you’ll want to find a highly skilled cosmetic dentist. If they keep up with the advances in cosmetic work, you can be almost positive they keep up with the general side as well. So, how do you find an expert cosmetic dentist in your area? I’d check the American Academy of Cosmetic Dentistry’s website. You’ll want to be certain to get a dentist who’s reached accreditation level. Do CEREC Crowns Last Longer than Regular Crowns? My dentist told me I need three crowns. I was shocked because my last checkup didn’t show any decay. He wants me to get CEREC crowns. I like the fact that they can be done in one appointment. But, my insurance only covers the older crowns. Is it worth the extra cost? Do they last longer than the regular crowns? When you’re talking about the longevity of crowns, it’s not as much whether you use CEREC or traditional. The length of time any crown lasts, regardless of the kind, depends on two factors—the skill of the dentist and the habits of the patient. On the patient end, it’s important you keep up with your home care. Regular brushing and flossing are a must. The dentist has several responsibilities. They have to choose the right materials. They have to know the proper techniques for attaching the crown. Traditional crowns are cemented. CEREC crowns are bonded, which is a completely different (and more involved) technique. Two dentists can make the same crown. One will last five years; the other will last ten. It wasn’t a difference between the type of crown as much as the skill of the dentist. Don’t hesitate to ask your dentist how long his crowns typically last. There are two advantages to CEREC crowns. The most obvious one is you can have all three of your crowns completed in one visit. Second, they’re milled by a computer which generally helps with their fit. They’re actually great for side teeth. Some cosmetic dentists don’t like placing them on front teeth because they’re milled from a single block of porcelain. In that case, they feel they can craft them better traditionally. Another weakness for CEREC crowns AND traditional all-porcelain crowns are on back teeth. They can’t always hold up to the pressure of the biting forces your molars have to take. In that case, you’d want either a metal-based crown or a zirconia crown if you have any metal sensitivities. No matter what crown you choose. Once the crown is made, the color is permanent, so if you’ve been considering teeth whitening be sure to do it before you get your crowns if they’re in a visible place. If they’re all back teeth, that won’t matter. You can get your crowns and then whiten later. One thing you said bothered me. You mentioned your last checkup showed no signs of decay and suddenly you need three crowns. That sounds just a bit hinky to me. While it’s possible that you could have decay that spread quickly, if you get regular cleanings there should have been some sign of decay. One of my front teeth needed a dental crown. I am tired of going to the dentist’s office and told him I’d prefer the one visit crown. But, he told me he never does those on front teeth. Shouldn’t that be my choice? I realize you said you’re tired of going to the dentist. But, let me ask you if going one more time meant the difference between a beautiful, natural-looking smile or something that looked good but just a bit off, would you be willing to make the extra trip? CEREC crowns are wonderful. They’re attractive, they’re strong. But, they’re milled from a single block of porcelain. Your front teeth are so visible and receive much more light than the rest of your teeth that they need all the natural subtleties that you can only get by using different porcelains. Traditional all-porcelain crowns don’t have that problem because your dentist can craft them using more time. Notice that as you go down the tooth it becomes more translucent but at the edges it’s a little more opaque. You can’t get that without baking different layers on. To accomplish that with a CEREC machine, you’d need an expert cosmetic dentist. Very few dentists can give you a stunning CEREC crown on a front tooth. But, if you absolutely cannot handle the idea of two appointments, you’ll need to go to the right dentist. Ideally, you’ll want a dentist who is accredited by the American Academy of Cosmetic Dentistry (AACD). These dentists have past stringent exams and demonstrated their artistry in creating beautiful smiles. Something you should also be aware of is any type of dental work, such as dental crowns, white fillings, or porcelain veneers will not whiten like your natural teeth. The color your dentist makes them is permanent. If you’re considering whitening your teeth, you’ll want to do so before you get your crown so it can be made to match your new whiter teeth. Can CEREC Crowns Handle Night Grinding? My dentist recently purchased a CEREC machine he’s very excited about. I have a cavity that he feels is too large for a filling. He wants to me have a crown done using the machine. I just wanted to get a second opinion as to how they hold up as well as normal crowns. My dentist said I grind my teeth at night. I’m assuming he would only give me a crown that would hold up against that, but just wanted to double check. This is one of those yes and no answers. CEREC crowns are every bit as strong as traditional crowns. The biggest difference is they’re able to milled at the time of your appointment, eliminating the need for either a temporary crown or a second appointment. However, I’m truly concerned about your grinding. When your dentist mentioned to you your teeth showed evidence of nighttime grinding, did he suggest anything to you, such as a nightguard? Your teeth need protecting. The stress of grinding will not only wear down the enamel of your teeth down, but can also lead to your teeth cracking and breaking. When your enamel wears down it leaves you vulnerable to decay. With decay, you’ll be looking at a mouth full of fillings. Even worse, would be the possibility of losing a tooth. Then you’re looking at getting a tooth replacement, such as dental implants or a dental bridge. While your choice of crown is fine, just like your natural teeth, it won’t stand up under grinding without you having some type of nightguard to protect both your natural teeth and your crowns. If I Get a CEREC Crown Will It Fall Off? I have a friend who got a dental crown. The temporary one fell off three times before his permanent one came in, then his permanent one fell off–twice. I’m wondering if it is because he got a regular crown. Would the same thing happen if he had gotten a CEREC crown? In reality, neither crown should fall off. The temporary is more excusable because they’re designed to come off easily. However, the permanent one, when bonded properly should have stayed fixed. A well-made crown could stay affixed without bonding (assuming you don’t eat anything extremely chewy). But when it’s made well and bonded, you’re safe. It sounds like this dentist isn’t the best when it comes to a proper understanding of either porcelain crowns or bonding. Hopefully, you’re not going to the same dentist. CEREC crowns are a little safer. They’re milled by computer so are more likely to be cut precisely. Plus, you don’t have to worry about the hassle of a temporary crown. I’m not sure where you’re getting the crown, but if it’s somewhere visible and you plan on doing any cosmetic work, such as teeth whitening, you’ll want to get the whitening done before the crown is designed. You can’t whiten crowns once they’re done. So, the wise thing to do is whiten your teeth and then have your crown made to match the new color. Are CEREC Crowns Worth Switching Dentists? I need to get a dental crown. My sister told me to make sure and get a CEREC crown, but my dentist said he doesn’t do those. My sister seemed to think it was really important. Is it worth switching dentists to get one? The only real benefit to CEREC crowns is they can be done in one appointment. While it is convenient, I wouldn’t necessarily think it’s worth switching dentists. The reason it can be done in one appointment is that it is milled on site from a single block of porcelain. The bigger issue would be where the crown is being placed. If it is a front tooth, you’ll want to be certain your dentist is experienced and artistic with cosmetic issues. You want to make sure that he can make the crown look both beautiful and natural.